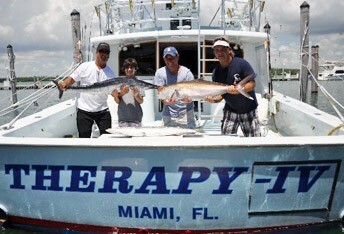 Miami Deep Sea Fishing Welcome to the THERAPY-IV website. Captain Stan and his crew of deep sea sportfishing experts have been fishing these Florida waters for over 40 yrs, providing private and shared deep sea and Biscayne Bay charter boat experiences of a lifetime to hundreds of people that have had a chance to fish with them. It doesn’t matter if it’s your first time fishing in Miami or you are a master big game monster catcher, you can count on the THERAPY-IV to make your day at sea a memorable one. See More >> That fresh new boat smell We are proud to announce the arrival of the newest addition to the THERAPY-IV fleet of deep-sea charter fishing boats. This state of the art 58 foot fishing yacht is docked right next to our luxurious THERAPY-IV. She has everything that can make dreams come true. Big, roomy and comfortable she is the vision of Captain Stan’s planning, dedication, and commitment to having this most beautiful fishing yacht, incorporating his knowledge and love for fishing and boating. See more >> Planning your fishing trip We know how exciting yet complicated it is to plan a fishing trip, especially if you are looking to experience it for the first time. Let the THERAPY-IV and her crew take care of it. Whether you are looking for a private experience or planning a corporate event day at sea we are happy to make all your arrangements. Conveniently located at Haulover Marina in Miami Beach Florida, you will set out from 8:00 am to 12 Noon or from 1pm to 5 pm for half day or 8:00 am to 4:00 pm for a full day. Our boats sail daily and can take groups of six (6), for larger groups we can coordinate with more than one of our deep-sea charter boats. Deep sea fishing in a charter boat off the coast of Miami Beach has great rewards. The combination of being able to stay close to shore yet catch some big game monsters make it an ideal destination for deep-sea fishing. Captain Stan and his crew know these South Florida waters like no other captain or crew out there, they have been fishing them for over 40 years! What kinds of fish can you expect to catch in the Miami – Ft Lauderdale area? The Atlantic waters of Florida offer a great variety of species and most of them you can find all year round and in the Miami – Ft Lauderdale area you can find the best ones. Here is a list of some: Marlin Sailfish Sharks Hammerhead Shark Blacktip Shark Mako Shark Dolphin (Mahi-Mahi or Dorado) Tuna Blackfin Tuna Grouper Tarpon Wahoo Barracuda Amberjacks Cobia Mackerel Snapper Black Sea Bass Triggerfish Kingfish Check out some of the monsters we have caught deep-sea fishing in Miami in our Daily Catch section. A few friends and I went out with captain Stan and his crew. We all had a great time catching Tuna and Wahoo! The staff was great and provided us with a great trip. Thanks again to all the crew of the Therapy 4!